Six of the GTA’s best builders came together to raise the game in Whitby. And they did, blending the most innovative architecture and the fine art of living like no other community in the GTA. The choice of homes is simply unprecedented, with the new release encompassing a whole new range of designs including freehold townhomes, semis, 30’ and 36’ singles, with a selection of both traditional and contemporary exteriors. The homes’ interiors are equally magnificent, bringing together the most modern features, finishes and conveniences. The range of sports and entertainment facilities to keep your family active is virtually endless, plus you have superb choices in everything from education to shopping to transportation. Living in Whitby is a smart move…and it’s easy to get even smarter! Here you can choose the best education for your child, with 20 public schools and 10 separate schools in the immediate area. And when they graduate high school, they can consider going to Durham College’s Whitby campus, the nearby University of Ontario Institute of Technology, or the Blyth Academy located in the heart of historic downtown Whitby. Just a quick drive away, you will also find major universities and colleges. Choose from the University of Toronto, Ryerson University, York University, OCAD University, Seneca College, George Brown College, Centennial College and Humber College, all easily accessible within the GTA. Your child’s education is important and in Whitby, they’ll go straight to the head of the class! 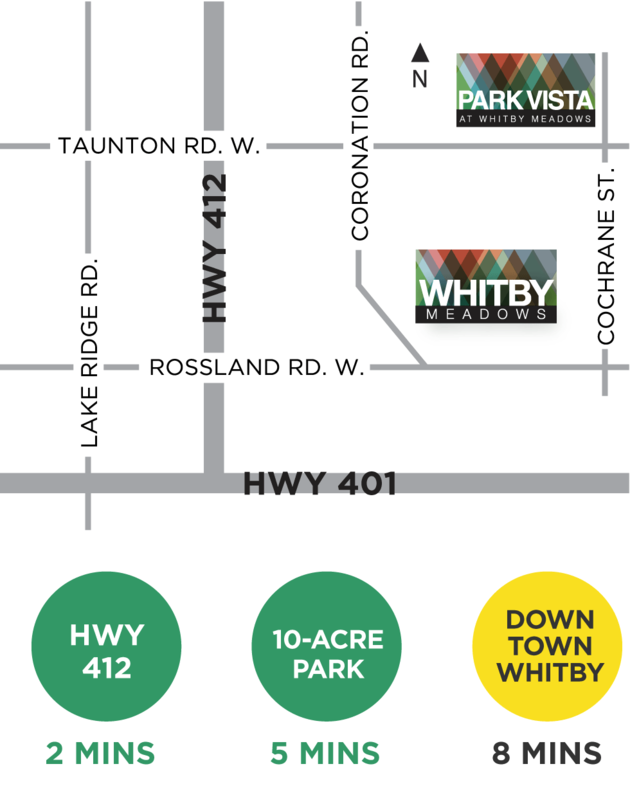 Whitby offers an exciting choice of sports and entertainment facilities to keep your family active and healthy with great arenas, soccer fields, baseball diamonds and swimming pools all located conveniently close. Take the Iroquois Park Sports Centre; for example -- Canada's largest municipally owned and operated recreation facility. This spectacular 250,000 square foot sports and entertainment complex was voted one of the "Top 5 Best Arenas in the GTA" by the Toronto Star. There is also the Abilities Centre – a state-of-the-art, fully accessible facility that helps people of all ages and abilities improve their health and well-being through an array of innovative sports, fitness, arts and life skills programs. Your choices don’t end there because you can also enjoy Whitby’s wide choice of restaurants, arts and cultural venues, movie theatres, live entertainment and the Whitby Courthouse Theatre. Plus whenever there is a special occasion to celebrate, the area offers a number of inviting banquet facilities ideal for hosting weddings, anniversary parties and more. If you want to get in the game, Whitby is the place to do it! Living in Whitby, you can get where you want to go quickly and conveniently. Your new home at Whitby Meadows is close to the 401 – the GTA’s main east-west artery – and located just 2 minutes from the new Highway 412 which links to the 401 and 407 – a major advantage for commuters and cottagers. Want to leave the car at home? The GO Station is also just minutes away from your new home, offering convenient access to both trains and buses. Plus, the Town of Whitby is well-serviced by a comprehensive network of local public transportation. Whether you’re on your way to work, taking the kids to their swimming lessons, or heading out into the country for a little antique shopping, Whitby Meadows makes getting there easy! Built around an inviting 10+acre park, Whitby Meadows is a truly one-of-a-kind community with its own welcoming green space in which to play and explore! Your choice of outdoor amenities includes a wonderful array of other family attractions that surround you. The Whitby area offers over 68 kilometres of recreational trails, 127 playgrounds, and more than 950 acres of lush, permanently protected parks. Minutes away from Heber Down Conservation Area with its many kilometres of walking trails is virtually right in your own backyard, and you can also hike or bike the nearby Ash Creek Channel Trail, Bio-Diversity Trail, Brooklin Lions Trail, Cullen Central Park Trail and Otter Creek Trail, Scott Trail. The waterfront is another one of Whitby’s major attractions whether you want to stroll along the boardwalk, go canoeing or kayaking, or pack a picnic lunch and admire the views. With 14 kilometres of scenic trails, marinas, pubs, trendy cafes and sandy beaches, it’s a favourite summertime destination. Don't forget your choice of outdoor activities also includes a host of championship golf courses located conveniently close. And when winter arrives, there's great skiing at both Dagmar and Lakeridge Ski Resorts too, both just a short drive to the north! You don’t have to go shopping anywhere else with it all waiting for you right here in Whitby! Whitby Meadows is just moments away from a variety of retail establishments to satisfy all your shopping needs whether you’re searching for something specific or just browsing. Rich in character, historic downtown Whitby offers first-class shopping with a uniquely diverse collection of stores and restaurants. Ramble down Main Street, enjoy the ambiance of the architecture, and stop at a café and re-fuel with a delicious cappuccino. Or find exactly what you’re looking for in the multitude of brand name outlets and big box stores. All are conveniently located just minutes from your new home and offering everything you need from hardware and home furnishings to the latest in fashions. Looking for a little retail therapy? Try Whitby on for size! An unbeatable location in Central Whitby, the Whitby Meadows community located just minutes from the new Highway 412 which links to the 401 and 407 for easy commuting. Enjoy great schools, colleges, your choice of leading sports and entertainment facilities, a wide range of nature trails and parks, and first-class shopping and dining. Easy for commuters, perfect for families, and ideal for investors. D’Hillier Park is across the street, Heber Down Conservation Area is up the road and Deer Creek is on the other side of the highway. Shop, eat and chill in one of Durham’s most charming town centres.